Anticipation for the 2020 Jeep Gladiator has reached a fever pitch, as Jeep fans yearn to jump into the truck world, and truck fans hunger for the taste of that sweet Jeep nectar. Now that the first Jeep pickup in 28 years is here, many wonder: Can it possibly live up to the hype? I just experienced the Gladiator on and off-road, and can say that, based on my short drive, the answer is yes. The Gladiator is everything you hoped for and more. Critics might say that the Jeep Gladiator—the first Jeep truck since the Comanche bowed out in 1992—is late to the mid-size truck game. Toyota, Nissan and Chevrolet have had pickups on dealer lots for years now, and Ford got back in the mix for the 2019 model year with the new-for-America Ranger. But while tardiness may have cost Jeep sales, the brand has come back into the truck world with a vengeance, and its new Jeep Gladiator—the only mid-size truck with an old-school solid front axle—somehow looks and feels significantly more modern than pretty much anything else in the segment. Just look at the competition. The current Toyota Tacoma, when it launched back in 2015, was “all new,” but it sure didn’t feel that way with a ho-hum interior with strange ergonomics, a dated six-speed automatic transmission, and a frame that ultimately shared some of its design with the 2005 truck. (The 2020 update gets a slight aesthetic redesign, and may fix some of the interior qualms, but it’s still largely the same as what debuted four years ago). Then there’s the Ford Ranger, which has a nice, modern 10-speed automatic and 2.3-liter turbocharged inline-four, but sits on a modified T6 platform that’s been sold in other markets since 2010. In other words, deep down, it’s old too. Same with the Chevy Colorado; it, too, was designed for an overseas market way back when (it debuted in Thailand in 2011), and was later modified for stateside use. It came to the U.S. in 2014, and the styling—and cheap interior—pretty much haven’t changed since. Then there’s the Nissan Frontier, the poster-child for mid-size mediocrity. It hasn’t received a significant update since “I Got A Feeling” was the only song you’d ever hear on the radio. All this is to say that, in many ways, “best in class” bars for the mid-size truck segment are low, and the Jeep Gladiator may have just disconnected its front sway bar and crawled right over them. The Jeep Gladiator “JT” is essentially a stretched Jeep Wrangler JL that Jeep threw a bed onto and altered to carry and tow more weight. Like the Wrangler, it is body-on-frame, has a five-link solid axle suspension in the front and rear, is powered by a 285 horsepower, 260 lb-ft, 3.6-liter Pentastar V6, sends that power through either an eight-speed automatic or a six-speed manual transmission, comes with a removable top and doors, as well as a foldable windshield, and is an absolute off-road champion (more on that later). Jeep’s marketing folks were adamant about distinguishing it as more than a “Wrangler with a bed,” saying the Gladiator has “more differences than similarities to the new Wrangler,” and claiming that less than half of the JT’s parts are shared with the JL. But as much as the marketing gurus want to avoid stressing the truck’s Wrangler roots, it’s clear that the finance folks embraced it, as the Gladiator makes a number of compromises in order to save cash by sharing components. For example, the wonkiest part of the otherwise fantastic exterior design happens behind the rear doors on the lower corner of the cab. There, you find a flat, featureless bit of sheetmetal instead of a nice, squared-off door. I have to wonder how much better rear bench ingress/egress could have been if the truck didn’t have to share that common closure with the JL. Then there are some little things like the switches, which have on their faces pictures of Wranglers instead of Gladiators. Pretty much everything from the Gladiator’s B-pillar forward—including the frame—is pulled straight from the Wrangler, sans the minor changes in grille opening for cooling, as well as the brakes, axle tube thickness on some trims, Rubicon shocks, and wheels and tires. None of this is a huge deal, and the switch thing I couldn’t care less about. The point, though, is that the Gladiator is indeed a Wrangler with a bed (this parts sharing is likely what helped Jeep make a business case for the truck in the first place), it’s just that it has been modified to handle mid-size truck loads. Among the modifications was, obviously, length. Compared to the four-door Wrangler, the truck’s frame is a whopping 31 inches longer, with 19.4 of those inches between the front and rear axles (the fuel lines, brake lines, and rear driveshaft have been extended to accommodate). That all makes it about six inches longer overall than the Colorado and Tacoma four-door trucks, and with a wheelbase almost 10 inches longer. It’s also heavier than both by about 400-500 pounds, if we’re comparing V6 trucks. This stretch over the Wrangler, the JT’s chief engineer Pete Milo told me, helps with towing stability. Between that, and the rear suspension—which shares all five suspension links with the new Ram 1500, and gets stiffer bushings, progressive-rate springs, unique shocks, a thicker axle tube, and a thicker sway bar—the truck is able to manage a best-in-class-for-a-gas-truck 7,650 pound trailer tow rating and a best-in-class-for-a-4x4 mid-size truck payload rating of 1,600 pounds. So it may be a modified Wrangler with a truck bed, but by the numbers, the Gladiator is very much a truck. And don’t worry, as I’ll talk about in a bit, it is also very much a Jeep. My drive in the Gladiator began at an old sugar mill about 15 miles south of Sacramento, and continued into the hills near the Eldorado National Forest towards Lake Tahoe. I spent a decent amount of time driving on the freeway, where the Gladiator Overland model I was in actually performed admirably. Sure, there was some wind noise, but the ride quality was surprisingly smooth. I was a little concerned that the rear end would be too stiff in order to handle towing and hauling, but Jeep is using progressive rate springs that get stiffer as they’re loaded down. This means, at or around ride height, the coils are nice and flexible. Not to mention the truck’s sibling, the four-door Jeep Wrangler Unlimited, offered a decent highway ride to begin with, so it’s not surprising that adding a foot and a half more wheelbase to squash out any remaining uncomfortable “pitching” over bumps results in a glider-like highway experience. My drive partner and I eventually made our way to some twisty roads in the hills, and in those conditions, the JT reminded me of its Wrangler sibling. The truck felt tall and loose in the turns, and the steering was about as vague and slow to respond as you’d expect from a tall off-roader with solid axles, soft springs, and an old-school steering box. As for the powertrain, the 3.6-liter Pentastar Upgrade V6 is rock solid. It makes enough grunt to push the truck up to highways speeds at a reasonable rate, and to help it climb steep grades, even if the motor does tend to spend some time high in the rev range. I wouldn’t call it quick, but acceleration is fine. The engine is aided by some great sidekicks, the first of which is the 850RE eight-speed automatic, which is basically a Chrysler-built and calibrated version of the ubiquitous ZF eight-speed design. It is, as on other cars, lovely, shifting quickly, smoothly, quietly and at the right times. The other option is a six-speed manual trans, which is the same as the one in the JL. While at first I wasn’t so sure I liked the D478 stick thanks to its smooth, cable actuation versus the extremely mechanical, direct-into-gearbox setup of the outgoing JK Wrangler’s NSG370 gearbox, I’ve come around to this new transmission. Shifter throws are medium-length and offer a decent feeling of gear engagement, the clutch pedal throws are short and neither too soft nor too stiff, and rowing through the gears is just a joy. I did notice what felt like large gear ratio “cliffs” when I shifted to certain gears. This, along with the engine’s not particularly grunty low rev range, hurt acceleration, so I had to make sure I was driving fairly quickly before popping into third. I also think the stick is a bit too far to the right of the center console. Still, despite those issues, I think the manual is the transmission to get if you’re an enthusiast, or if you’re just a cheapskate, since the auto costs an extra $2,000. Then there’s the interior, which is an area where the Gladiator really separates itself from the competition. It’s the same cabin as the JL, which is to say that it’s rather simple. But it’s high quality, and if you compare it to most other trucks in the segment, it feels like it’s in a different league. I only got to tow a 5,000 pound boat with that white Jeep Gladiator Sport S you see above for about 10 minutes, so I can’t offer any sort of comprehensive towing assessment. Yanking heavy loads with the truck basically just involved hopping in, firing the truck up, dropping the shifter into drive, and stepping on the pedal. There was no specific tow/haul mode button available to alter shifts (Jeep says it integrated that into the trans calibration, in part, to keep the switches common with JL), and there was no trailer brake controller, though there will likely be one available in the future, I’m told. Unfortunately, my towing was hampered by a trailer that was bucking and banging around behind the Gladiator’s rear bumper. It wasn’t a particularly comfortable experience, but I think the issue had to do with the trailer setup, and not the truck. In any case, the V6 engine and the eight-speed got the Gladiator up to speed just fine, though the motor was yelling quite a bit as it revved itself out to make more power. The larger-than-JL brakes seemed to stop the truck without drama, but that’s not surprising considering I wasn’t driving at high temperatures or down a steep, long grade. The table above shows the tow ratings for various trims and transmission options. The big takeaways are that the Sport with the Max Tow Package can pull the most, and gets the same 4.10 axle ratio as the Rubicon, which—with the automatic—can tow an impressive 7,000 pounds. Manual transmission trucks are limited to a maximum of 4,500 pounds. At some point, I’d like to test the truck again over a longer haul, with a better trailer setup. And with the Rubicon model, as I think that truck has potential to be an especially awesome rig for towing off-road rigs to the trail, and then actually participating in the fun when it gets there. Simply put, the Jeep Gladiator is, for a mid-size truck, a monster off-road. Jeep made a custom off-road trail on some hilly property out in the middle of nowhere in California, and, as it had been raining, the whole thing was a giant mudfest. In fact, just getting to the trail required off-roading, with ruts that could swallow a Jeep Renegade. This meant that, instead of just driving the hard-core off-road Rubicon models through the rough stuff, I had a little time to stretch the legs of a Sport and Overland model, both of which had standard all-season tires, connected sway bars, and taller gearing in the transfer case and differentials. From a traction standpoint, the manual Sport and automatic Overland both had no issues in the soupy muck, but it’s not so much the traction that I was impressed by, since there was some solid ground beneath the watery filth, it was the truck’s ability to keep its bumpers and body panels from banging against the trail. From the Rubicon, you might expect good performance in this area, but the fact that even the base Sport and the Overland have 40.8 degree approach angles, 25 degree departure angles, 10 inches of ground clearance, and underbody protection for the automatic trans, transfer case, and fuel tank means you can buy literally any Gladiator and hammer on it out in the sticks (the 18.4 degree breakover angle on those trims leaves something to be desired, though). 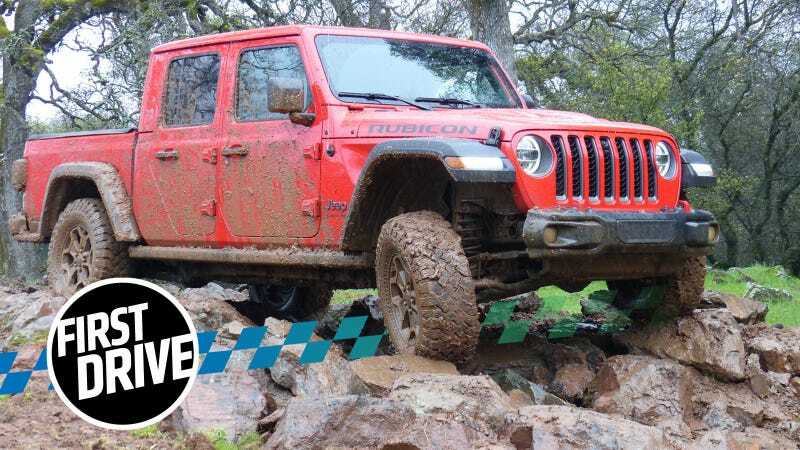 The Rubicon gets much of the same hardware as the Wrangler Rubicon: a Rock-Trac transfer case with a four-to-one low range ratio instead of the standard 2.72 in the Sport and Overland; Dana 44 wide-track axles with locking differentials and 4.10-to-one gearing; an electronically disconnecting sway bar; 33-inch all-terrain tires (Falkens instead of the JL’s BF Goodriches) and rock rails. Plus, the truck adds Fox monotube shocks, a rear steel bumper, and steel bars to protect the box. The Rubicon I drove through the trail had the optional Falken mud-terrain 33s on it, and though they slipped a bit on some of the muddy, wet rocks, they handled the job well, and play a major role of giving the truck approach, breakover, and departure angles of 43.4, 25, and 20.3, respectively, as well as a whopping 11.1 inches of ground clearance. That great geometry allowed me to navigate the convertible pickup through the admittedly rather mild course consisting of muddy trails and small rock gardens while barely scratching up the underbody skid plates. Pull the Jeep’s transfer case lever into low range, and it’ll crawl up anything with just a tiny touch of the gas; disconnect the sway bar, and the four tires will grab ahold of the earth even if it’s filled with craters; flick on the lockers, and let those mud terrains pull you up steep inclines. The enormous length meant I had to watch to make sure the truck’s bedsides didn’t hit anything, but despite that, it became clear on that course when it comes to low-speed off-roading, the Gladiator is at the top of the pack. I don’t think anyone is surprised that the Gladiator can beat the rest of the truck class in pure off-road capability, but what is surprising is that it offers towing and payload capability at the top of the segment, while also being the freshest both on the inside and out by a wide margin. And it was at that moment shown above that I really became a true believer in the base manual Sport—the very cheapest Gladiator you can buy starting at $35,040. It may not have the fancy creature comforts inside that you can get for a similar price in other trucks, it may only score 19 MPG in combined driving, it may make compromises to share parts with the Wrangler, and it may not handle that well. But between the manual trans, the decent ride quality, the fresh interior and exterior, and of course the ace-in-the-hole that is the removable doors/top and foldable windshield, the Gladiator—based on my short test—somehow ended up better than even the Jeep truck I’d been dreaming of. Convertible fun, exterior and interior styling, off-road capability, highway ride quality. Handling, fuel economy, interior comfort features-per-dollar. Meets your off-road and roof-off-fun expectations, then dazzles you with styling and towing/payload ratings that are at the top of the class.